The two jump-seats were definitely original in covering. They could easily be removed from the car and protected during the restoration in early 1950. As the leather and carpet coverings were removed the tacks were coming out of the holes they had made in 1918. There were no extra tack holes in any of the wooden structural parts as there had been with the front and rear seat cushions. Removal of a hidem bead allowed access to the tacks holding the seat back covering in place. 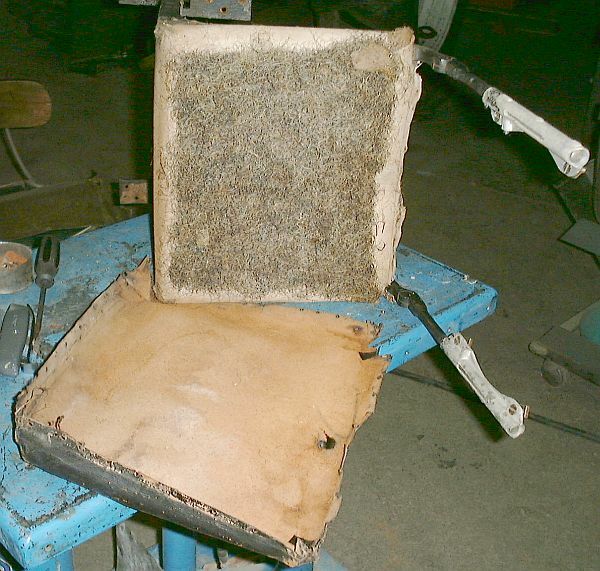 With the seat back leather removed a piece of thin gray felt covered the wooden seat back frame. A piece of industrial cardboard was underneath tacked directly to the seat back frame covering a rectangular opening in the frame. Removing the tacks that held the seat back front leather covering in place allowed it to be pealed off. 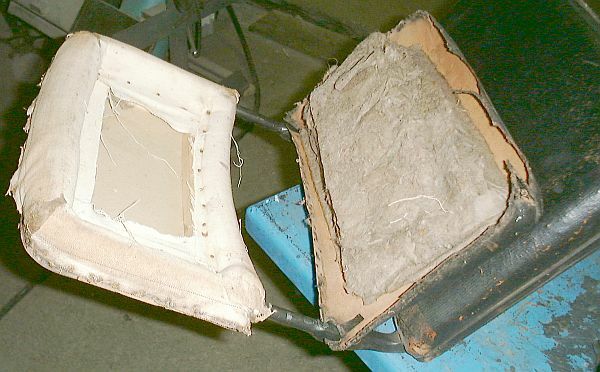 The perimeter of the seat back had duck cloth tacked in place which appeared to be covered with a thin layer of jute or hemp matting. There was no horsehair in the seat back. Pealing the layer of matting away revealed multiple layers of gray felting filling a recess formed by the duck cloth that had been tacked to the outer perimeter of the wooden frame. Removal of the tacks securing the duck cloth to the wooden frame allowed the half-round sections of gray felt stuffed duck cloth to be removed. Four flat head machine bolts secured the frame to aluminum slides that were guided by the two solid rods which held the seat back in place. With the frame removed and access to the two aluminum slides it became obvious that the seat backs were intended to slide. Years on lack of lubrication had caused the aluminum parts to become stuck on the steel rods. The carpet was removed from the "underside" of a jump seat by prying out the tacks in the decorative edge sewn to the carpet. The underside of the seat is actually visible when the seat is stowed and thus it is covered with the same floor carpet material as used for the back of the front seat and for the rear floor in order to match. The wooden structure of the seat was now visible. The seat's construction is basically a pair of identical steel supports sandwiched between wooden panels. A one-piece wooden L-panel forms the core and the steel supports are screwed to the edges of the L-panel. 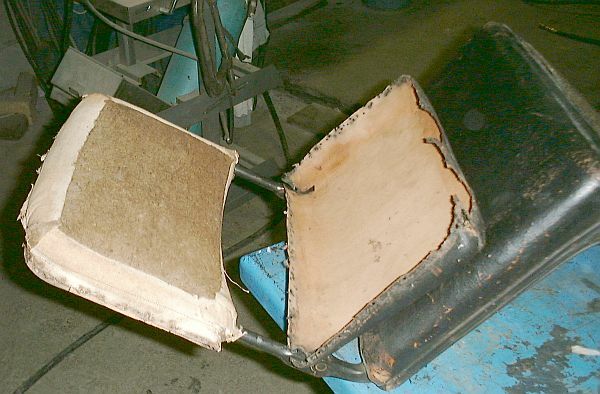 Wooden strips then are screwed to the outer surfaces of the steel supports to provide a place to tack the leather and carpet components of the seat bottom. 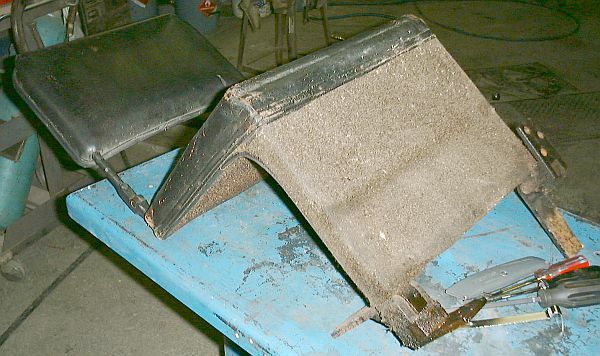 At the end of the steel supports are hinged castings that screw the seat to a support member in the floor of the car. 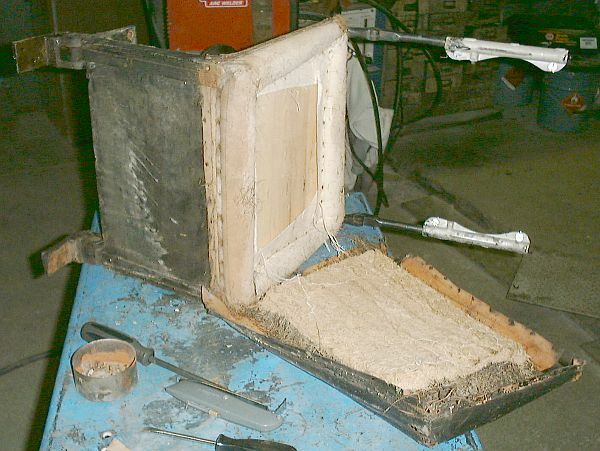 With the tacks removed that held the leather seat bottom covering in place the covering could be removed to expose a layer of horsehair and another border of duck cloth tacked to the perimeter of the seat bottom. Lifting out the thin layer of horsehair revealed more hemp or jute matting and the perimeter of duck cloth filled with gray felt. With all the materials removed access to the screws was possible. Four wood screws held the wood tacking strips to the steel frame and secured the steel frame to the edge of the wood panel. Years of use had allowed the screws to loosen so disassembly was really simple. All of each seat's covering materials were carefully labeled and stored for eventual use as templates when the seat was recovered. Once apart the steel frame was glass beaded to remove the old paint. The frame was primed and painted with the Imron gloss black to match the car's fenders. The seat back slide mechanism was lubricated and made functional. The wooden panels had split and some glue joints had come apart so repairs were made as necessary before the wood panels were given a couple of coats of flat black paint. As the oak plank that went between the frame members of the car's body and held the two jump-seats were in poor condition a replacement plank was fabricated. One of the results of rebuilding the two seats was that the wood panels of the seats had shrunk over the years and with the each jump-seat reassembled the ended up about 3/16" narrower than original. As the jump-seat mounting castings are actually recessed into the mounting plank the original plank provided a rough placement of the seats and the new plank was made to fit the seats after their restoration. 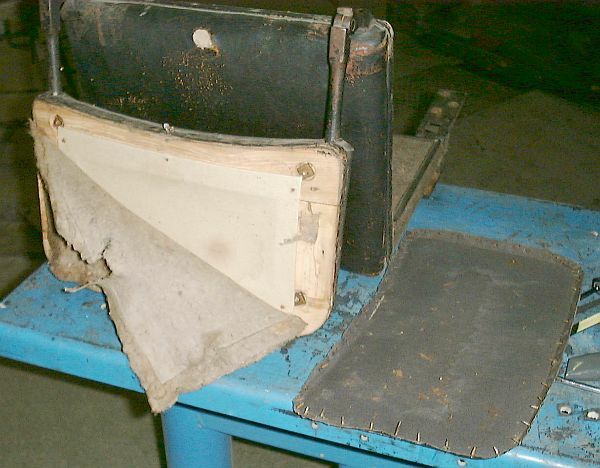 Originally the jump-seats had been screwed to the support plank but age and use had stripped the screws so as part of the replacement plank the use of machine bolts and captive tee-nuts would insure possibility of stripped screws would not occur in the future. Additionally the support plank used small metal angles to hold it in place on the wooden car body frame. 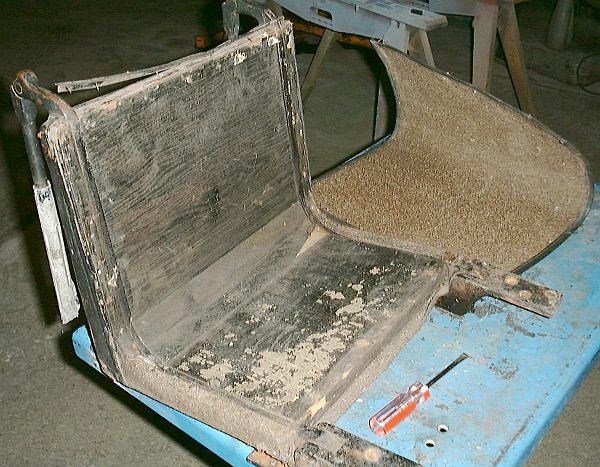 Again stripped screws had occurred so heavier aluminum plates were used to support the plank off of the car's frame as well as the car's wooden body frame to insure someone sitting in the seat would have a secure ride without fear of falling backwards onto the feet of passengers in the rear seat.